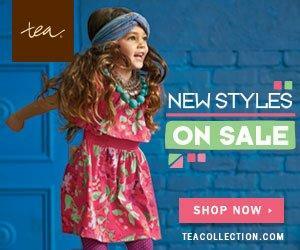 Go check out all of the new styles that Tea Collection has just put on sale! Twirly summer dresses, fun graphic tees, sweet little sun tops, excursion-ready shorts ... all perfect for a summer full of adventure. Don't miss this chance to replenish their wardrobes with the latest styles for little citizens at Tea Collection.